As the weekend approaches, a lot of football fans will place a football accumulator, combining all of their favoured results into one far larger bet with a substantial price. With the clear popularity surrounding this method of betting, sports betting website FootyAccumulators opted to serve their followers with a mobile app that helps you to monitor your bet as it unfolds. Considering the number of football fans who now use AccaTracker, we’ve looked at how effective it is, and how it could potentially improve your betting activity over the weekend. Available on iOS via the App Store and on Android. Linked to a live feed from Opta for up-to-date and accurate information. Includes football fixtures spanning across England, Europe, and the rest of the world. Key bookmaker markets such as Match Result, Both Teams To Score (BTTS), Match Result & BTTS, Handicaps, Correct Score, and all other primary variations. Notifications available for kick-off, goals, assists, goalscorers, substitutions, and bookings. Opportunities to track current bets, past bets, and any that you have coming up. With no fee to pay, the AccaTracker App couldn’t be much easier to download. It’s available on Apple and Android devices, as well as through a direct download link on the FootyAccumulators website. After choosing to add AT to your device, all you need to do is agree to the Terms and Conditions, connect to a source of internet, and you’ll be ready to get started. The app itself is even available outside of the UK, with the only exception being if you’re choosing to bet in countries that adhere to gambling restrictions. In offering a feature that makes it easy to pick, build, place, and monitor your football acca, the AccaTracker app provides a service that you won’t see elsewhere. You’re given the chance to compare your odds with all major bookmakers before placing any money on your bet, allowing you to take the best available odds on the bet you’re looking to make. 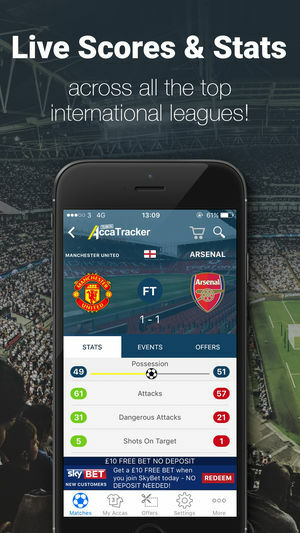 A lot of punters might stick by placing their bets through a favoured bookie, but the AccaTracker App is a way of unbiasedly presenting you with the strongest bookmaker odds while making it easy to keep tabs on your bet without even needing to keep the app open through push notifications and instant updates. You aren’t limited to making an acca made up of several selections either, with any variation available including singles, doubles, and any number of multiples.